Natural parrern in nutty rich colours. Larger more doll like size and appearance. 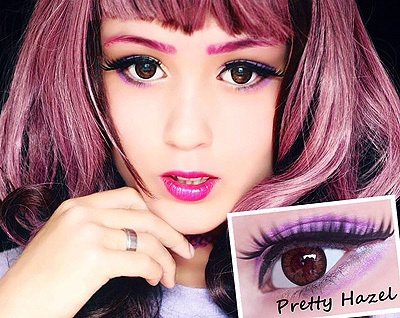 If you're planning to change your eye colour into brown, you might be interested in ColourVue Big Eyes Pretty Hazel contact lenses. Not only will they give your eyes a beautiful and natural brown colour but also they will make them distinctly bigger thanks to the outer black ring that they feature and their bigger diameter. Thanks to both of those features, they can be used as costume contact lenses and on a daily basis.